With its amazing shopping opportunities and reputation for high-end luxury, New York isn’t somewhere that would strike you as being a cheap destination to visit. 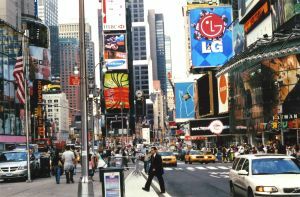 Yet with a bit of shopping around, you can find cheap New York flights and good value accommodation and dining options when you get there. The great thing about New York is that many of its iconic landmarks and attractions are free. It’s perfectly possible to pound the New York pavements and take in the stars of the skyline, including the Empire State Building, the Chrysler Building and the Rockefeller Center, without spending a dime. You could also come over all Audrey Hepburn and window shop in Tiffany & Co, or make like Rachel in Friends and have fun exploring the huge department stores Macy’s and Bloomingdales. If you’re still in the mood for window shopping after this, then let you inner child loose in toy emporium FAO Schwartz. Another free activity, which you can enjoy any time of day or night is experiencing the bright lights of Times Square. Then, of course, you have the amazingly vast, world famous public space that is Central Park. No trip to New York is complete without joining the joggers, the lovers and the dog walkers on a stroll through the park, which is beautiful at all times of year. Unfortunately, when it comes to accommodation the bottom line is that New York isn’t cheap. If, however you do your homework you can get good value digs in the Big Apple. The Distrikt Hotel is a modern, well-placed establishment with lots of nice touches that will delight even the weariest traveller. Featuring clean, cool rooms in a monochrome décor, and amazing views of the Chrysler Building, the Distrikt is surprisingly good value for money. Those who like space but don’t want to pay a premium for it should check out the Candlewood Suites on 39th Street. With kitchenettes, laundry facilities and a gym; staying in these well-located apartments is a great way to keep costs down. For many, eating out is an important part of a holiday that is not to be compromised. Tourists on a budget will be pleasantly surprised to know that some of the best food in the city is sold on the ‘sidewalk’. New York street vendors sell everything from the basic hot dogs, pretzels and tacos, to slightly fancier options including barbecued meats, grilled steak and rice platters, kebabs, falafel and even arepas (a Columbian dish made of ground corn dough). Also, let’s not forget the many pizza places where you can grab a slice of the ‘pizza pie’ that New Yorkers are so passionate about. Eating takeaway food means that for around five dollars or less you can enjoy a different filling lunch each day of your trip. Sometimes, however, you want a sit down meal that isn’t going to cost the earth. In that case, head to Carmine’s on 44th Street for the opposite of the usual fancy restaurant food. Huge portions are served at this popular Italian located near Times Square, in a friendly (sometimes raucous) atmosphere. The best bit is that the prices are very reasonable (considering the huge portions). In fact, you can easily share one meal between two and still be too stuffed for pudding. Amazingly, there are also places you can go in New York city to be fed for free. Head to the Crocodile Lounge and get a whole free pizza with every drink, or to Burp Castle which hands out free fries. Another great place for free food is the Doghouse Saloon which hands out free hot dogs and has a huge screen for patrons to watch various American sports. With food, drink and entertainment all rolled into one, it is possible to have a fun, cheap night out with just a few dollars in your pocket. Those who have more refined tastes will be keen to take in a Broadway show while in NYC. The price of tickets can be off-putting, but theatre fans should heed one little tip to get the cheapest tickets for the best shows in town. The TKTS ticket booth in Times Square sells heavily discounted tickets for that days performances. The downside is that you may well be in for a wait as the queues are often very long. Whatever your tastes and interests, there’s a way to do New York on a budget. Simply think outside the box for clever accommodation and dining options and you could be biting into the Big Apple sooner than you imagined.